Miss Print: Great friends, some fabric, a book, and one very mangled package! Great friends, some fabric, a book, and one very mangled package! Alright, so seriously guys, the giveaway next week to celebrate my two year blogiversary is going to be awesome! Some really amazing fellow bloggers have signed up to giveaway some wonderful prizes (I'll give you a couple of hints... Tula Pink, not yet released Moda fabrics, patterns, and soooo much more! ); so far on the list of awesome people participating are John, Heather, Jennifer, Katy, Ryan, Kate, Angela, Stef, Trish, and Jessica - woohoo, you guys are the greatest! If you'd like to participate in my little giveaway let me know! Either leave a comment on this post, send me an email, or say hi on Twitter. I will, of course, also be putting a little something in for the giveaway but I'm not letting go of hints on that one quite yet. My actual blogiversary is on the 17th and depending on how many people want to join in on the fun I will either do a huge giveaway on the day of, or spread it out over three days. Speaking of giveaways, I have a few things to show you... I won some giveaways! I actually won this first giveaway a little bit back and received it in the mail at the end of May/beginning of June but completely forgot to show pics! You all know Elizabeth of Oh, Fransson right? Well this awesome package of Mingle and Groove fabrics by Robert Kaufman is from her; isn't it pretty? These fabrics would be absolutely perfect for a boy quilt so I'm keeping them stashed until I come up with the perfect pattern. Right before we left for Moncton I found out from Austen that I had won one of the giveaway's on Canadian Living's craft blog, Make & Do. I received this copy of Handmade Nation from Austen on Wednesday and I love it. Doesn't it look at home there sitting next to my Euclid quilt? And last, but definitely not least, I won one of Heather's super-cool birthday giveaways and I think I came out alright! Look at this gorgeous stack of Tufted Tweets by Laurie Wisbrun! Laurie donated this awesome fat quarter stack, as well as some prints from her Donkeys and Wellies Spoonflower-printed collection (which was won by Karrie) to Heather's birthday extravaganza - thanks Heather and Laurie! But thankfully Heather overdosed on wrapping the package in plastic and used lots of packing tape so the contents were fine! We had quite a lot of rain this morning and I guess my mailman is not very good at keeping packages dry (that's another point against you Canada Post). Funnily enough, my Handmade Nation book also arrived in a mangled package and the guy from Purolator said that it got stuck in a conveyor belt - gee whiz! I'm going to spend the night sewing and working on some new patterns, since it has finally cooled down enough to actually sit in front of the sewing machine and use an iron for any length of time! Hope your Friday has been lovely! WOW...am I first to comment, not sure that is a good thing! I have been a follower and a fan, for a while and am excited for your giveaway. WOW...you scored some serious loot there...awesome! Um, I have Tufted Tweets envy! And I will for sure be watching for whatever Tula Pink is sending your way! Happy blogiversary! Happy blog anniversary from a fellow Canadian. I found your blog on another blog that I follow, (forget which one) but was happy to find a good Canadian blog. I don't blog because my life isn't that interesting.But I do love to quilt and I love to see what everyone else is doing. Boy you are lucky I thought I never won anything because I lived in Canada and postage costs so much.Have a wonderful day blessings. I have never seen a package ripped like that, at least not until after I have my grubby little hands on it. You are a lucky duck winning all those great prizes! I swear Kaye! You seriously have the best luck at giveaways!! You heard about my run in with the post office a couple of weeks ago - mail truck with 4 of my packages inside, burned to the ground. My giveaway for your blog - a Pocket Full of Posies apron and a copy of the Sew Hip magazine that featured that pattern of mine. I'll send you a photo in a few days. Wow, you've been lucky lately, Kaye! Glad to hear that your Tufted Tweets were safe. That's the most mangled package I've seen yet! Sounds like your giveaway is going to be fabulous! Wow, Lots of lovely fabric - Lucky Ducky! I am sure your giveaway is going to be just as exciting! Good loot! Maybe that was customs' way of inspecting your package? Geesh, kinda looks like a dog got ahold of it! What nice prizes you have won Kaye- I am sure you will create some beautiful quilty things with your fabrics. Enjoy the book too. 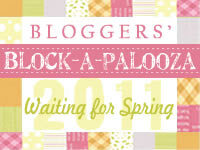 Happy Bloganniversary- the time flies when you are having fun blogging. I really enjoy meeting people from all over the world. It always nice to meet a fellow Canadian. Happy Blog Anniversary! What a lucky person you are to have won such pretties. Glad the Tufted Tweets survived. I have admired Laurie's designs for quite some time. Thank you for having a giveaway, but it seems to me that non-bloggers rarely win and especially those in Canada. I know it is a random draw, so I keep trying. I've read so many nice things about you on other blogs and was surprised to find you were from Canada. Good Luck! Not sure if your giveaway will extend to the UK - if so, pelase could I enter? Congratulations on your anniv!Don't we all get so excited when we have a chance to win something?Thanks for offering this. Canadian eh? Awesome. Me too!! Kaye! :) Are your ears burning? TMQG had their executive meeting tonight and we were talking about you!